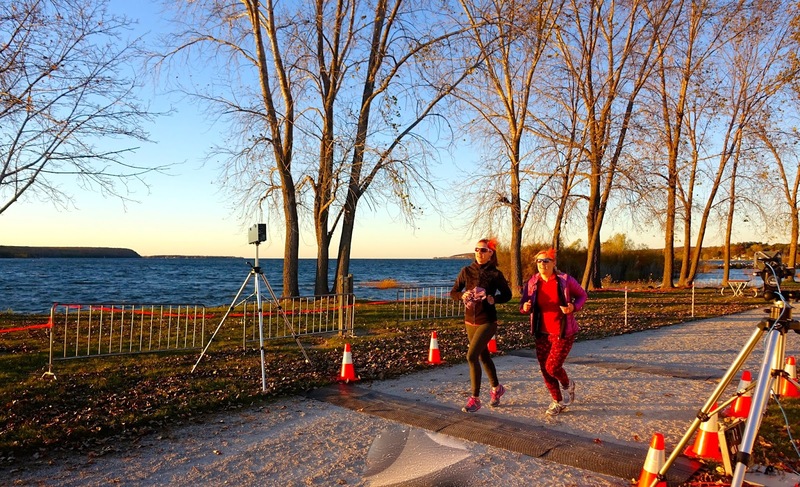 Last Saturday, I had the great pleasure of joining 670+ runners for the 9th annual Fall 50 in Sturgeon Bay, WI, this year’s USATF 50-Mile Road National Championship. We had an epic day of fast running and smiles, much in thanks to optimal weather, great competition and race organization, and one of the best post-race parties in our sport! I was thrilled to come away with a 7th place finish, a new 50-mile PR (6:11), and my second USATF Masters National title this year. But most of all, I will cherish the charm and embrace of this wonderful slice of Wisconsin community that kept a smile on my face from the moment I walked off the plane. It is definitely worthy of a visit! The Fall 50 has been around for years as a local favorite relay race (450 runners were here for the relay, which sold out in one hour! ), but it first hit my radar when it became the site for the USATF 50-Mile National Championships for 2014/15. I recalled when local Wisconsin hero (and American/World Record Holder) Zach Bitter had set the course record with a blazing 5:28 in 2011, and suspected it was a PR-worthy course. 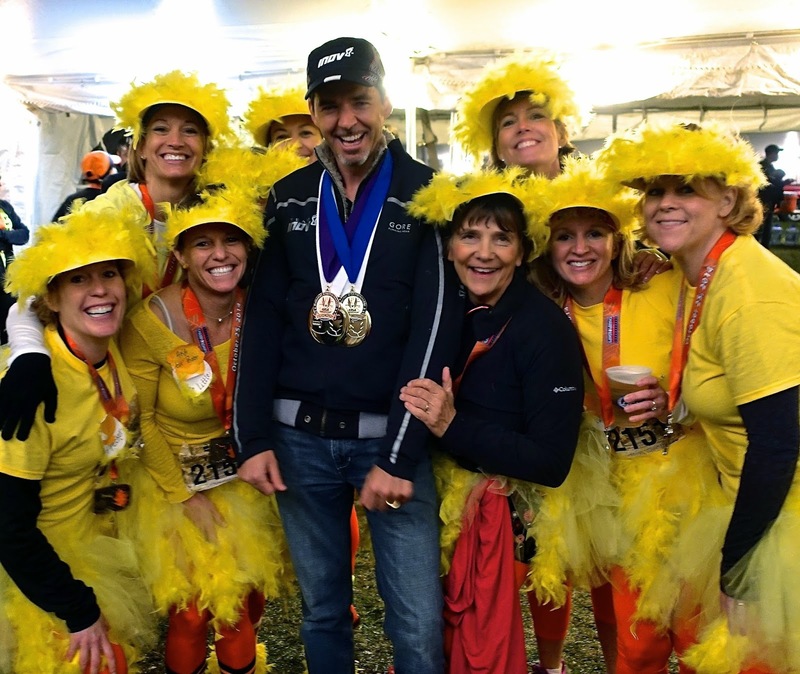 It turns out that thanks to Zach, Race Director and Founder Sean Ryan, USATF evangelist and Wisconsin running hero Roy Pirrung, and hard working Door County representatives, the race quickly went from a seasonal running celebration to the main stage. A perfect excuse to check out a part of the USA I have never seen! 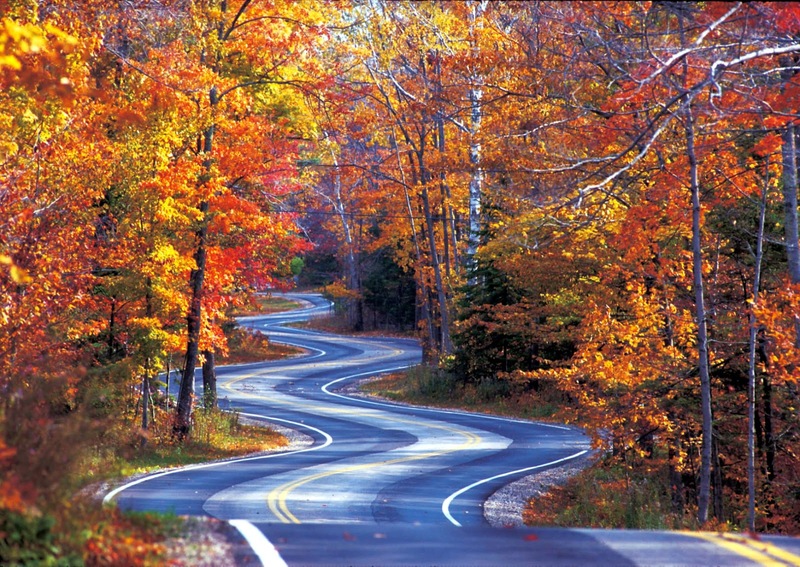 Straight up , y’all…Wisconsin has got to be one of the nicest communities in America. From dah endless tank youse fer comin' to their little town, to Dennis and Bonnie Statz at the White Lane Inn bed and breakfast who would settle for nothing less than a live band in the living room post-race, the runner-shaped cookies, quilts, and signs that filled the stores...this lakeside town couldn’t possibly have been more welcome. 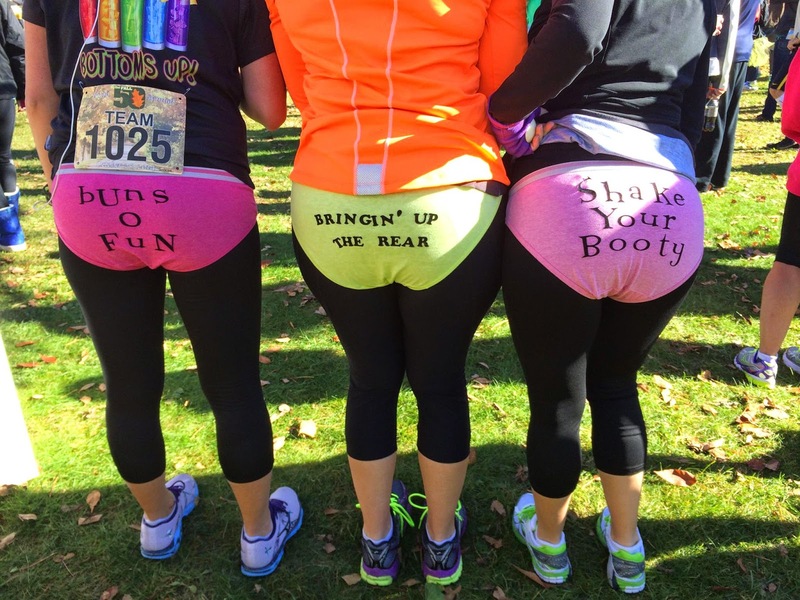 I instinctively adopted their "Oh, geez" and "Watcha doin', hey" lingo as the relay vans arrived in droves with costume-clad runners, praising the "fair to middlin' good weath-har, as sure as God made little green apples". SOOOO awesome...I couldn't get enough! 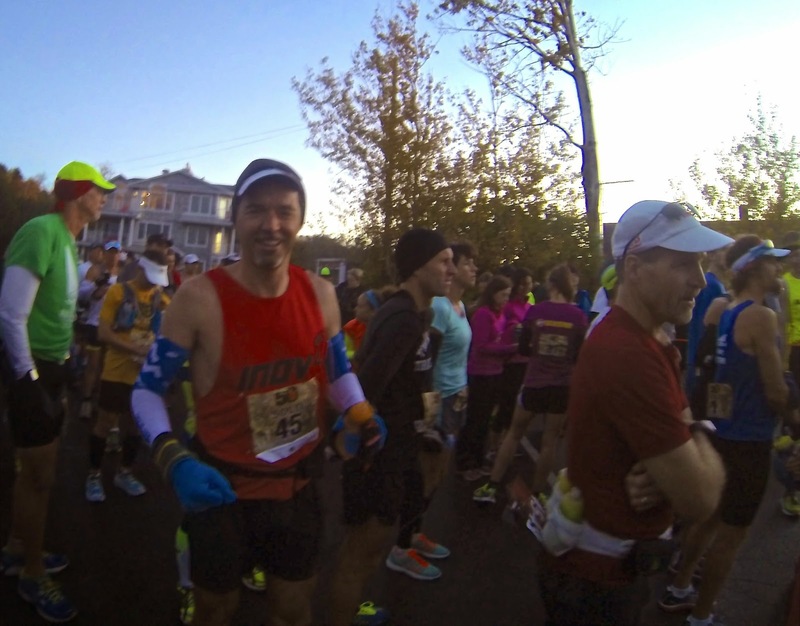 I felt like I made 20 new best friends by the time I picked up my race packet. Regardless of the race outcome, the trip was already golden. Come race mornin', I was feeling peaked and ready, much in thanks to having six weeks of semi-employment that allowed for long runs and afternoon naps with the dogs. My 10-day taper produced all kinds of weird niggles and tightness, a sure sign the body was building up. The mind and heart were in a good place too - humble and grateful to have my health and an excuse to adventure with my fellow running warriors. The road ultra is a particularly challenging venture, since many of us will be at top speed on unforgiving surfaces for the entire race. It is the asphalt crucible from which, as we have learned through trial of pain and blood, springs the purest fountain of humility and grace. GAME ON. As we boarded the buses to the start, I immediately spotted Team Adidas runner Dr. Josh Brimhall (yes, that's "Dr. Brimhall" - Phd in Education, who knew? Respect, yo!). We passed the time in the dark ride north talking about his expansion of the Red Rock Running Company empire, my crazy experiences doing data science for Eaze (the Uber of Medical Marijuana...definitely a "growth" industry), and his meticulously planned sub-5:50 goal for today (whoa!). We only had a few short minutes to get prepped before they sent us off at 7am. Up front, Zach Bitter and Tyler Sigl set the pace, which us mortals were best to leave alone. Zach is the American Record holder in the 100-mile (11:47) and Tyler had clocked three 2:19 marathons and a 5:27 trail 50-miler in the last two years, and both runners were rumored to have a "sub-5 hour 50-miler" goal. Holy Cri-yiy! 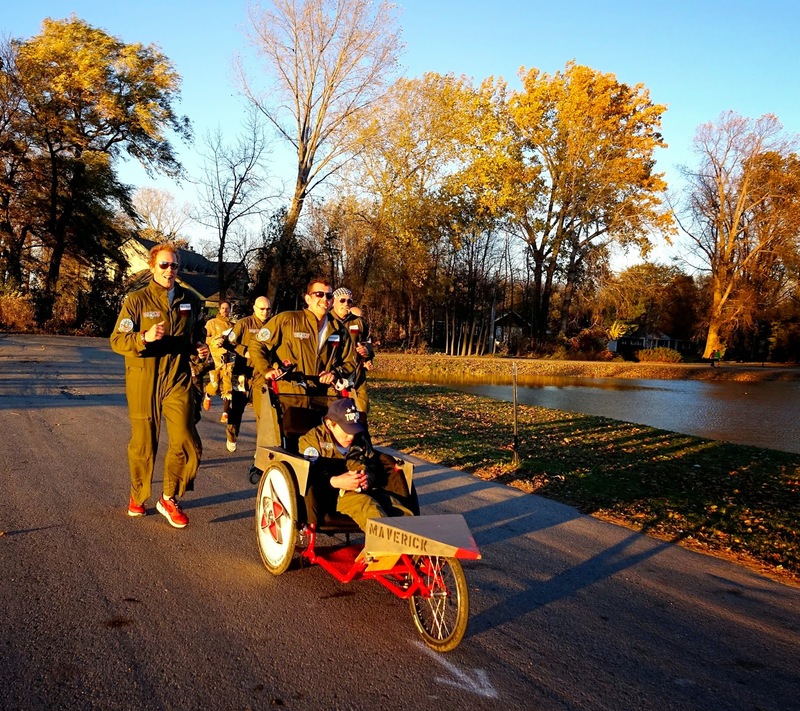 (as the locals would say) A pack of five began chasing behind them, including former winner Mark Thompson, Twin Cities speedster Mike Bialick, Josh Brimhall, and a few others. I settled in with the lead women, including Mill Valley, CA's Larisa Dannis tuning up for the IAU 100k World Championship in a few weeks, Team USA Olympic triathlon member Dr. Bennett Isabella, and some first-time 50-milers on a 7 min/mile pace in the next pack. 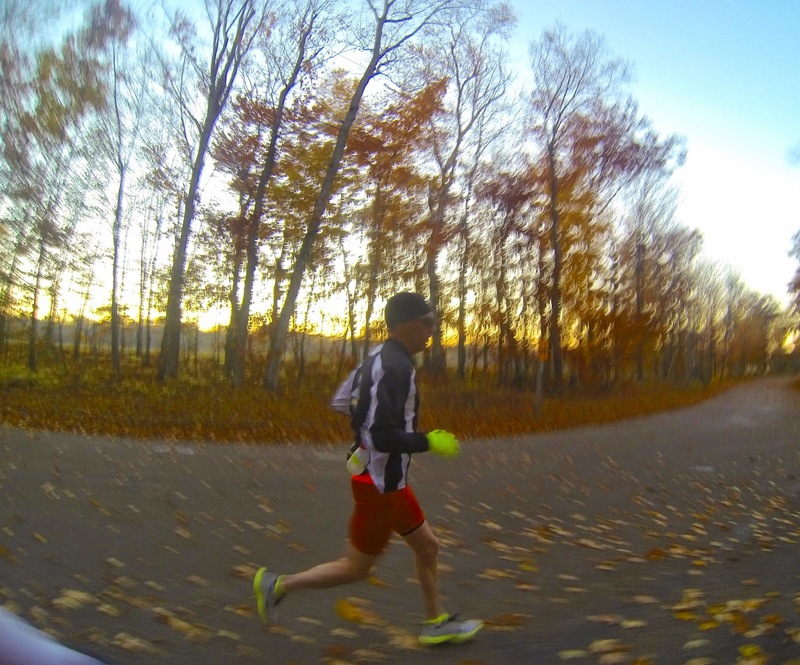 As the sun rose up in the first 10 miles, the hillsides lit up with orange, amber, and gold. 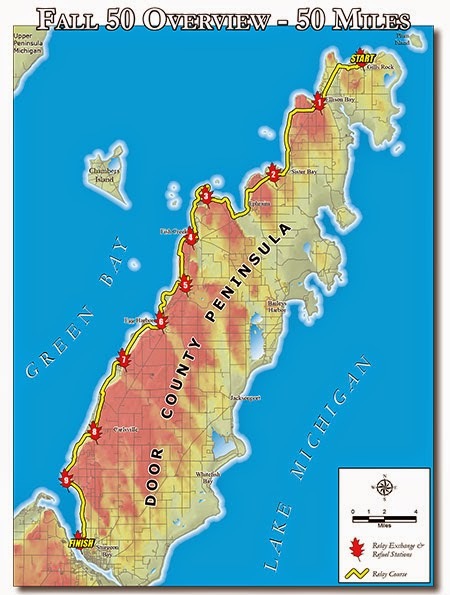 Door County is a majesty of American beauty! The wind spun leaves all around us, and endless V’s of geese honked ensemble against the headwinds as we padded our way down the remote highway. It was easy to just kick back in our groove and knock out the miles. My pace partners Bennett and Indiana's Justin Kowalski kept the conversation light, and made for a good target to catch up to when I manually refilled at the aid stations. The hills were just about right - not giants, but big enough to shift your muscle groups regularly. By mile 24, Bennett and Justin shifted down a gear as Larisa started to crank it up and come by us. I let her set the pace for a few miles, and we yapped about how deep Team USA is at the 100k Worlds for both men and women this year (Zach Bitter, Max King, Michael Wardian, Zach Miller, Matt Flaherty, Joe Binder, Pam Smith, Meghan Arbogast, Amy Sproston, Cassie Scallon, Emily Harrison...the list goes on). Two guys blazed by us, and I thought for sure the relay teams had been released, but it turned out to be Josh Brimhall and Mike Bialick who had gone a few miles off course due to sign sabotage. Josh decided to ease up on his original goal and coast it in (note - this is still a sub-6 hour pace for Josh), while Mike just got pissed off and ran like a banshee. Zach Bitter also took a wrong turn, and decided to drop and save up for 100k Worlds. There you go, folks - the three ways one can react to a wrong turn! I hit the marathon mark in 3:06, and then the 50k mark in 3:40, and allowed myself to daydream of lowering my 50-Mile PR of 6:35 set last year. 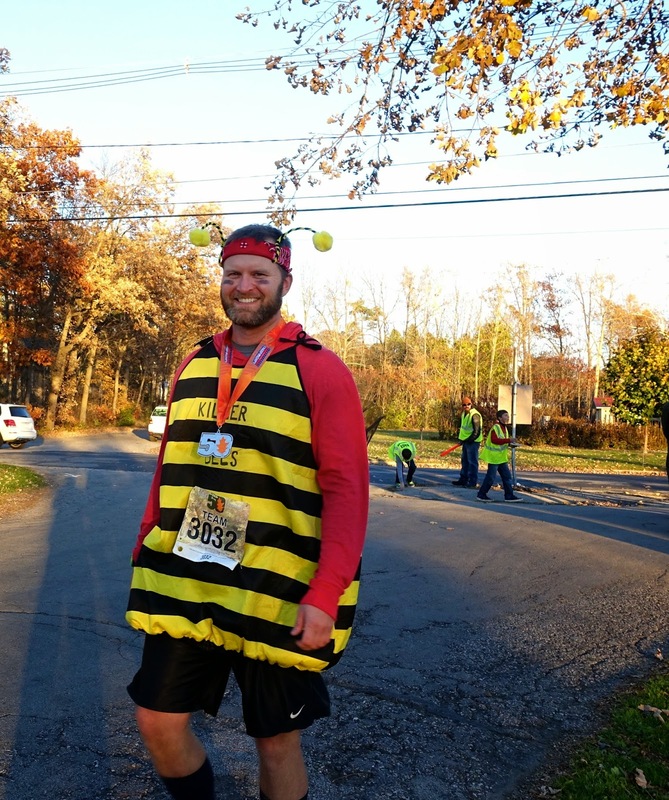 I started getting a little dizzy at mile 34, and Josh (ahem, sorry...Dr. Brimhall!) was nice enough to wait at an aid station for me, prompt me to calorie up, and run a few miles together to get me on the right track. 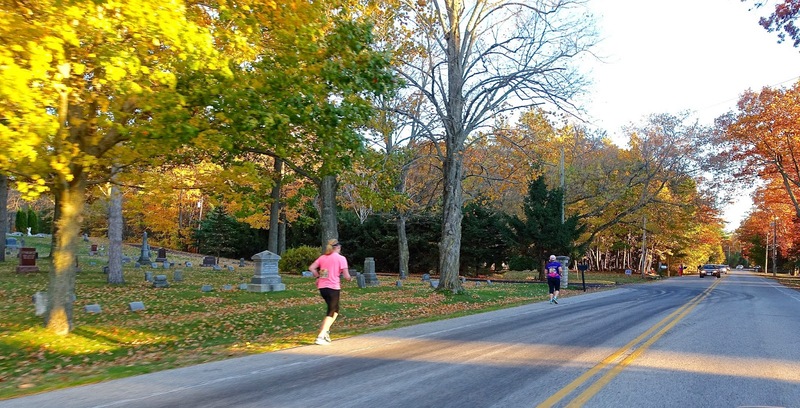 We talked about the best music to listen to while running, which is always a great subject. Josh's joy of the music spectrum knew no bounds, as long as nothing repeated itself. I, on the other hand, am known to repeat the same guitar solo over and over for hours in my head. Right now, it was Led Zeppelin's Whole Lotta Love (the weird bridge part with all the echo). "Great song!" he said, and with that, he took off in the distance. Whoops...maybe I should have mentioned a slower song! As we weaved up and down some short hills (mile 39 being the toughest) and the endless straights between corn fields, the locals would yell out our place, which ranged from 5th to 9th. I suspected I was somewhere around 8th place and the second Master, after watching some guy with a M50-55 bib take off with the second pack in the first two miles. Knowing he was out there was pushing me hard, since I know a lot can go wrong in these races. My pace had slowed to 7:30 min/miles, and Josh was still within sight, pulling me like a kite. I focused on my form, letting the Zeppelin whirlwind keep my tempo going. At the last aid station (mile 46), I still hadn't seen my Masters adversary, and my body was screaming to ease up the pace (in a "you better carry toilet paper if you're going to keep doing this" sort of way). I gulped down some watered Coke, and one of the spectators, a crew member for a runner about 10 minutes behind me, gave me a pat on the back and said "you show those youngsters!". I let him know there was a 50+ year old ahead of me schooling me, and he said "no, dude...that guy is about ten minutes BEHIND you...has been for 12 miles". What? Well, I better get moving then!!! So funny...I'm not sure which is the bigger motivator, being the hunter or the hunted. Wait, no, it's definitely the hunted! GO, GO, GO!!! 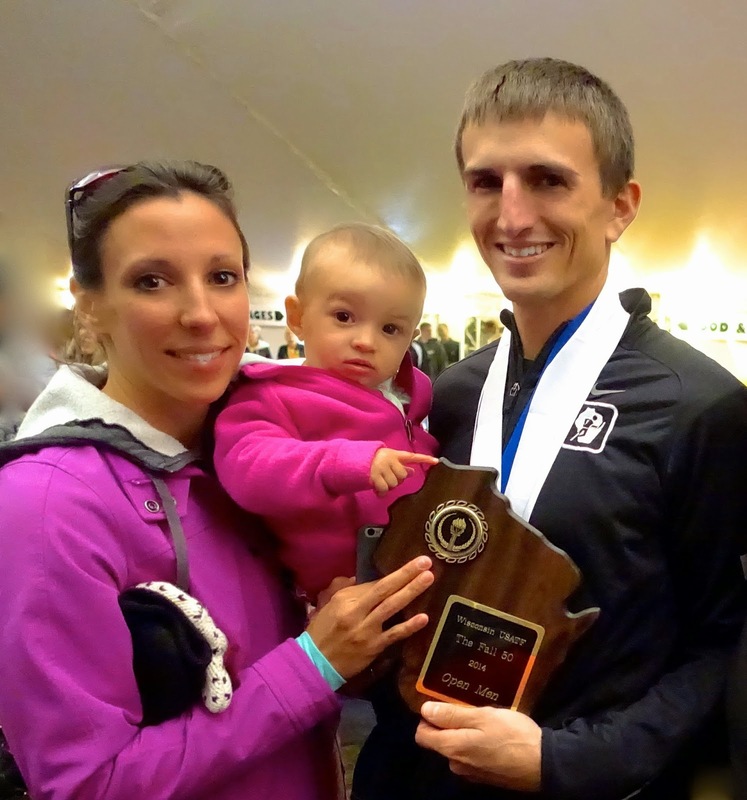 Tyler Sigl had won in 5:32, after holding a sub-5 hour pace for 32 miles. Wrong-turn Mike Bialick raged his way to 2nd (5:45), while former winner Mark Thompson (5:52) and Eric Tatge (5:53) also went under six hours. Larisa Dannis broke the Women's course record with a phenomenal 5:59, showing she is clearly ready for the 100k Worlds in a few weeks (good article about her race at RW, plus you can read her race report). Carolyn Smith (6:28) won the Women's Masters, also beating the previous Women's CR and making the Top 10. Wow, what a fast crew! 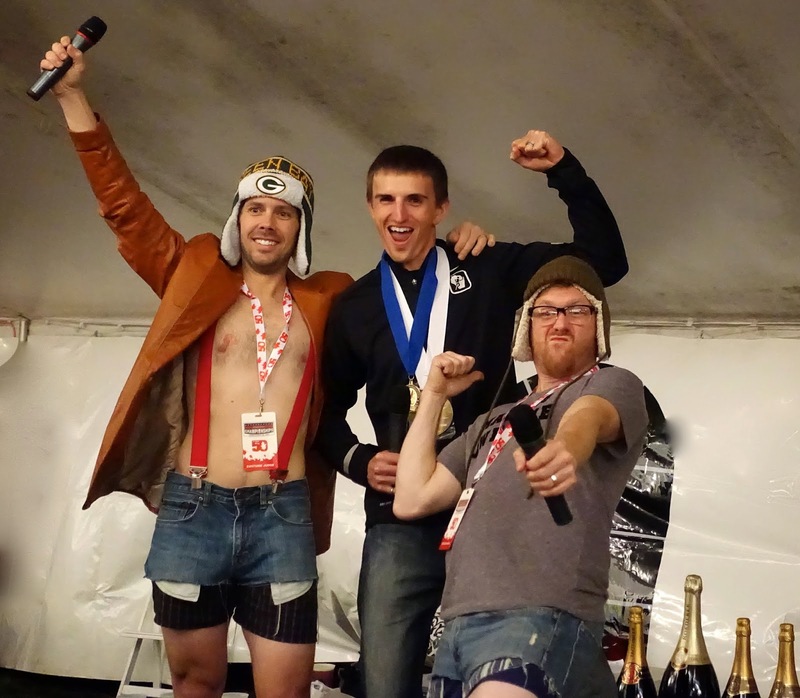 The post-race party was nothing short of insane. 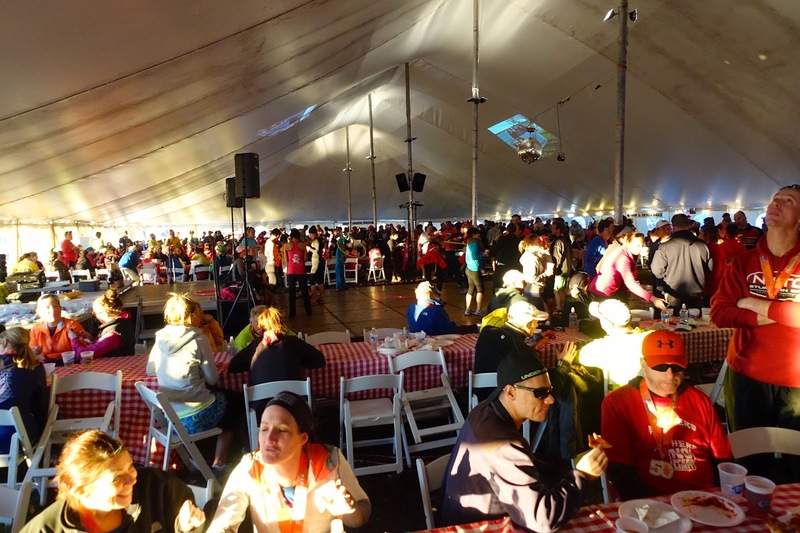 Runners packed the Oktoberfest-sized tent, enjoyed libations from a half dozen local breweries and wineries, and hit the dance floor to hunting cap-clad DJ's spinning the good stuff. RD Sean Ryan did an amazing job recognizing the winners, with special recognition to a group of runners who stopped their race to revive a guy who passed out. The medals were crazy huge, and I felt like Michael Phelps walking around with all my bling. As I kicked back with Bennett (who finished in an impressive 6:42) and his friends and family, we all remarked at how polished this event was from start to end. I can see why it's a local favorite, and suspect many more will be coming next year! 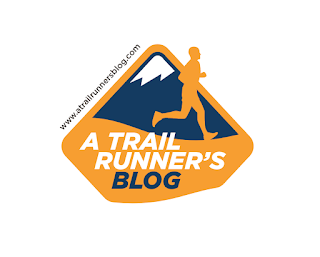 I have always enjoyed using the trail running Series like USATF, Montrail, Skyrunning, etc., to expand my geographic experiences, and when it turns out a gem like the Fall 50, I am nothing but smiles. 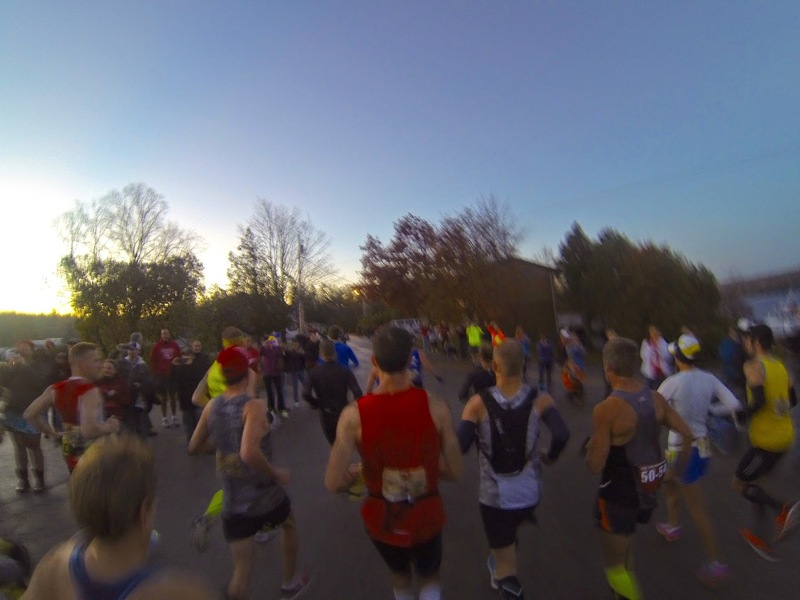 My thanks to Sean Ryan and his amazing crew of volunteers, the people of Door County 'Sconsin, and my fellow runners for putting on a fantastic race. This one is WELL worth the trip, and I highly recommend it! 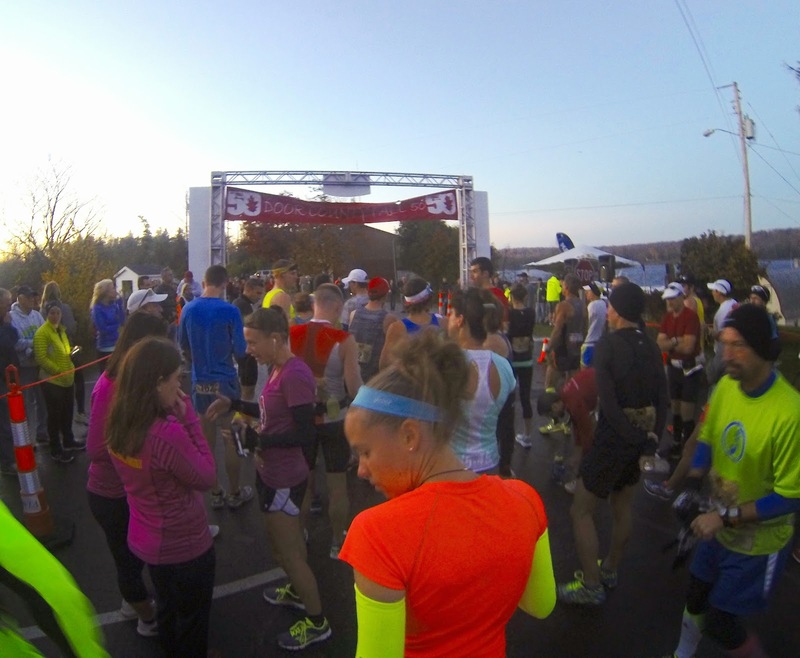 A sub 5 minute pace for 32 miles is a new world record in the 50k. That would be impressive! By "sub-5", I meant under 5 hours for the 50-Mile, which was what Tyler and Zach set out to beat. It has been done before...4:51 is the current world record, set by Barney Klecker in 1980. Bruce Fordyce has the current 50M record set in 1980 (4:50:21). Klecker probably has the American record? Ah, I think you're right. 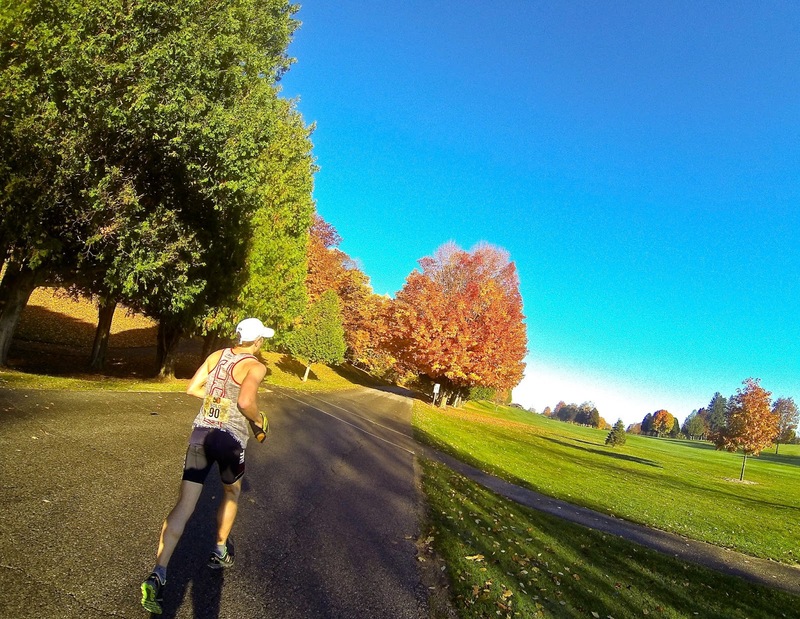 I got the Klecker time from an American Ultrarunning site. Congrats on a great race (and a ridiculous number of medals - do you really know what each is for?). I really hate to hear about course issues throwing off runners, but it's interesting to see how different runners react to something like that. (Still, I'd prefer there being nothing to react to.) Sounds like a great event - thanks for letting us all know about it. In truth, this course was INSANELY well marked. I think the issue was one missing sign, but combined with some ill-informed runners and volunteers urging those runners the wrong way. These things happen, and all the runners told me they would come back next year and get their speed on again. The medal haul was insane! My girls love the big gold ones, which now adorn all the stuffed animals. - A big gold Fall50 medal for winning the Masters. - A big gold Fall50 medal for winning my M45-49 age group. - A USATF medal for winning my age group. - A USATF medal for being the 6th male. - Most important, the Fall50 finisher medal! 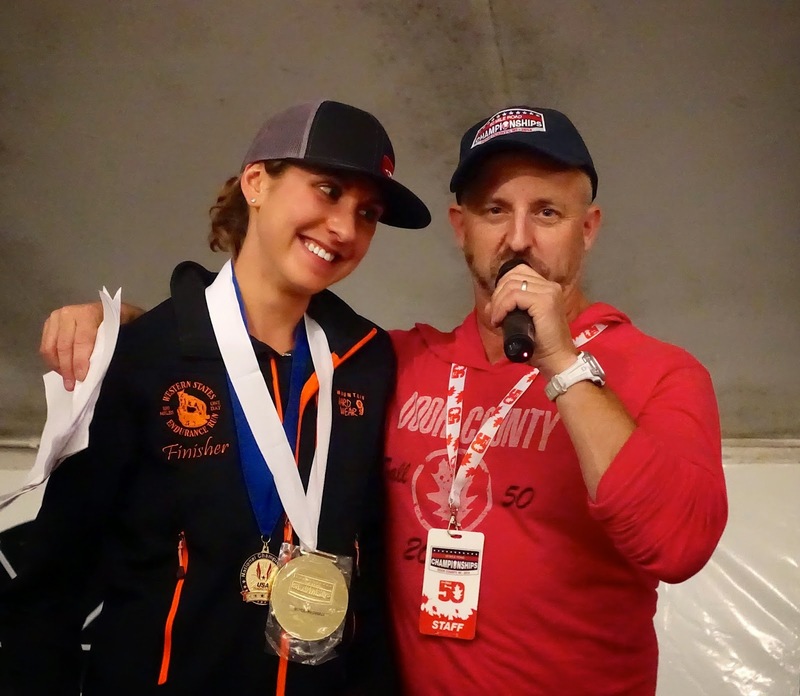 Plus a great red hoodie for all finishers, a nat'l champion patch, free beer and wine at the finish, and a check for $500 for first Master (winners got $2,000!). It was a big haul, even for a shwag hag like me! Sean and his sponsors have this race dialed. Wow - just got one more big gold medal in the mail for 6th male...they really went big with the medals! 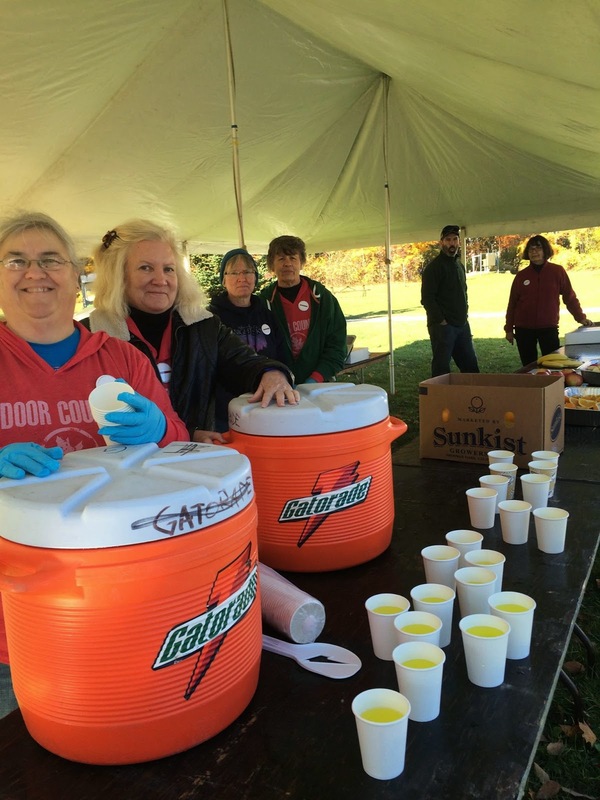 Sean - your race organization was extraordinary! Very well run, and I found the course to be perfectly (if not excessively) marked. I hope to see those guys back next year and put that sub-5 hour 50 into action! Zach Bitter, not Miller - right? The event was top notch in every way. I think Sean also puts on the local triathlons too. Congratulations, Scott, on an amazingly fast run! Thanks for the excellent write-up, too. 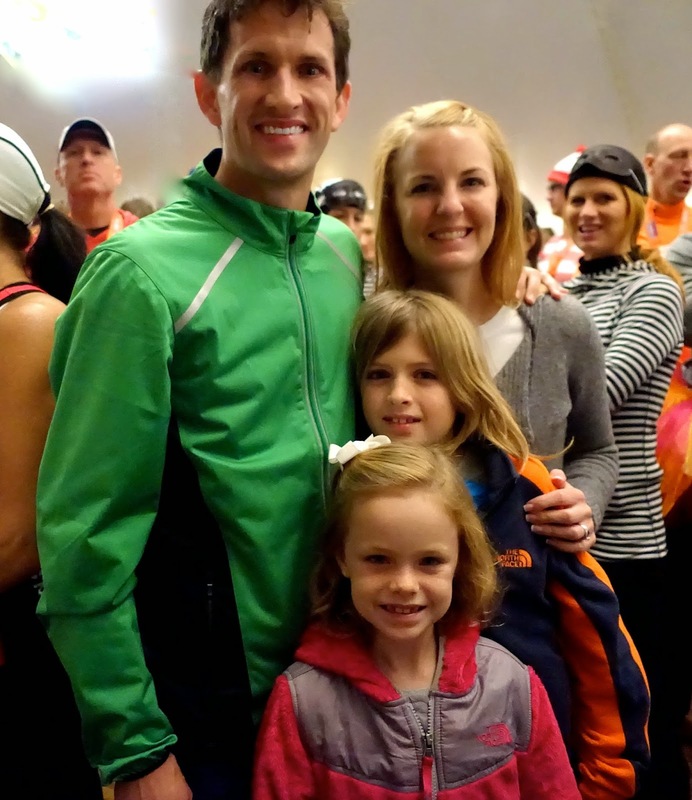 You're an inspiration to us masters runners. Thanks, Ron! Good to hear from you and I hope to see you out on the trails soon. what a super write-up! you front of the pack guys are so fast. very inspiring. i'm doing the american river 50M as my first 50M this spring but this one looks great for next year. 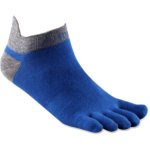 Scott, what Inov-8 shoes did you wear for this race? Congrats on the time! 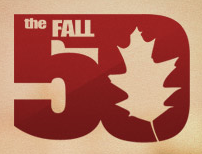 Enjoyed reading the write up, and it encouraged me to think about doing the Fall 50 next year. 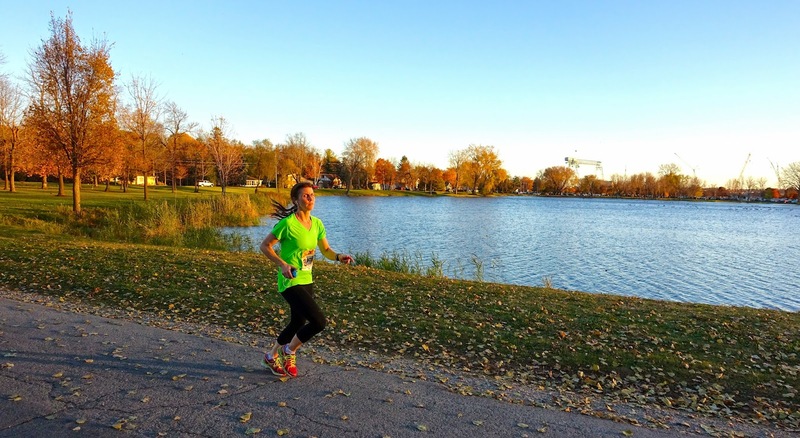 As far as pacing, how would you compare that course to a relatively flat marathon? I'm trying to figure out what a reasonable goal time for this race would be, assuming I'm in shape for 50. What would you recommend as far as mile pace adjustment-1 minute slower, 1:30, more? Thanks! My best 50-mile time is exactly one minute per mile less than my best marathon time. More importantly, my 50-mile pace is my "conversational pace" that I feel is purely aerobic. That's really what you want to target - the pace you KNOW is aerobic. Perhaps even tougher is that you have to be 100% on your drinking and eating for 50 miles. In a marathon, you can miss a little here or there, but in the 50m, you have to get it all.